Protecting a wooden cutting board is essential in keeping it from drying out and absorbing unpleasant odors. With the help of oils, there is a slower absorption of food flavors and water, as well as a prevention of oil build-up that can cause your cutting board to become sticky. Maintaining a wooden cutting board is a vital factor in our everyday kitchen routine, so it is important to know the right oil to use. With so many options, we are faced with a dilemma on which kind of product we should buy. 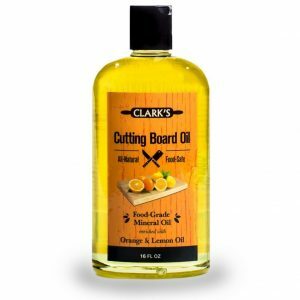 There have been different information on which kinds of oil are suitable for maintaining cutting boards. To help you out, here is a guide about oils recommended for sanitizing your board while keeping them beautiful for a long period of time. 3. 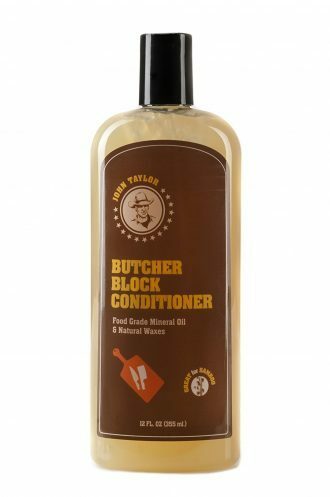 John Taylor Butcher Block Conditioner Food Grade Mineral Oil and Natural Waxes, 12 oz. There are different kinds of oil that are ideal for your wooden and bamboo cutting boards, butcher blocks, salad bowls, utensils, and other kitchen items. You have to be careful in choosing oil because others may cause harm instead of enhancing your boards. These include varnish, vegetable oils, and rubbing alcohol. Also known as liquid paraffin, this oil is colorless and odorless. 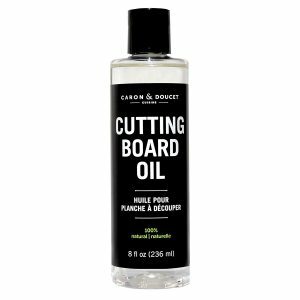 It is a non-drying oil that moisturizes your board, while preventing a plastic-like coating similar to what you get when you season a pan. There are several kinds of mineral oil out there, so select the food-grade mineral oil which has properties that will not pollute the food that gets in contact with your board. Also, check if the product is labeled “white mineral oil” as these are the ones refined and considered safe for food. This natural wax has been produced in the beehives of honey bees and can leave a nice gloss on your board. If mixed with another kind of popular oil, a thicker layer is created which is more water repellent. Beeswax is known for its great effect for cutting board maintenance and can also be used for hydrating and waterproofing purposes. For those who prefer plant-based oil, this can be a good option for your board. It can work wonders in keeping a cutting board in great condition. Because of its high saturated fat content, however, it is slow to oxidize and boards that have been applied with this oil can acquire unpleasant smells after a period of time. This type of oil is a popular choice among professional woodworkers because of its water-repelling properties. It is a drying oil that can give a food-safe coating on your board. The drawback is the oil being organic which can cause rancidity after a period of time. Unpleasant smells can be a disadvantage, but if you are able to choose a quality oil from the right sources, you can get one that is great for maintenance. Similar to Linseed Oil, this type has its positive and negative effects. Since it is a nut, there may be some people who are allergic to it and it can also be more expensive compared to other oils. The good thing about it though is that it smells really good and it has the ability to create a resilient finish. 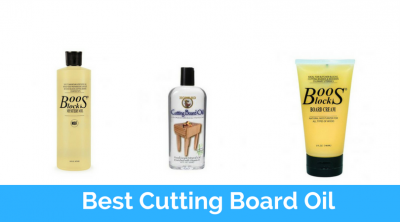 These are a mixture of oils and waxes that have been proven and tested to protect your cutting board. Because of it being a mixture of oils, people who have specific preferences should take caution in choosing what kind they want, depending on the mixture. This is still one of the most popular products especially for those who want a basic choice for their cutting board. Since you already have an idea on what kinds of oils can be used for cutting boards, it would also help for you to know what the best cutting board oils are according to reviews. 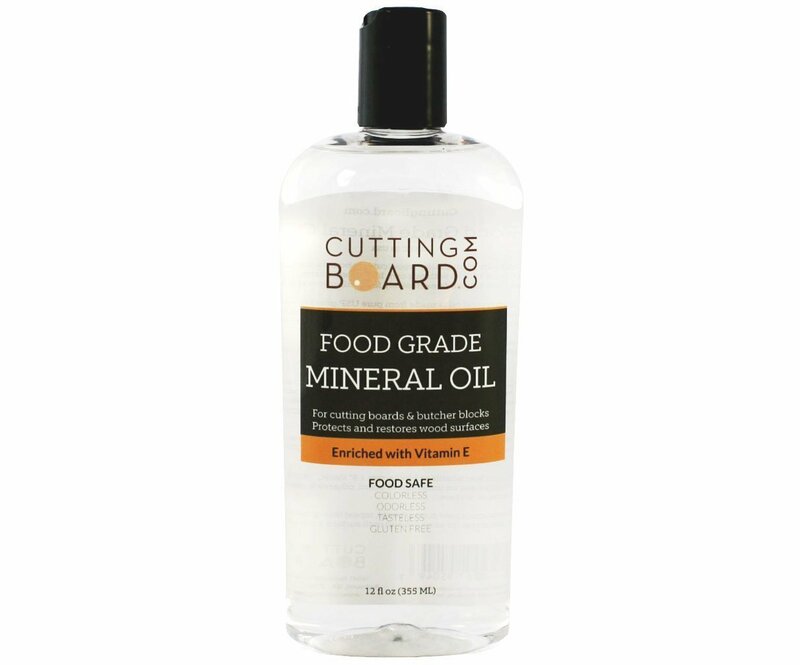 This food grade white mineral oil is of the highest quality that can be used for your wood products, bamboo cutting boards, countertops, salad bowls, and utensils. It is easily absorbed into the wood to protect it from drying or cracking. You can use this product every 3 to 4 weeks by applying a generous coat on the entire surface of your cutting board. Spread evenly and make sure that the sides of your board are treated as well. Do not wipe off excess and leave it for 4 hours or overnight for lasting absorption. It is made from pure USP mineral oil which is safe for food contact and can give you lasting effects. This type of oil can sink very quickly into your boards and revive old ones that have been dried up for a long period of time. With this product, your utensils and other kitchen items are kept in great working shape to avoid damages and replacements. The bottle is also designed in a way that makes it very easy to open and use. It provides a beautiful and enhanced effect on a wooden board and other items that will surely leave you in awe. This natural and vegan formulated product is completely safe to use for your food preparation services. Simply apply a thin layer of the oil on the whole surface of the butcher block or cutting board. Leave it to soak into the wood for at least an hour or for the whole night. Wipe it off with a clean cloth afterward and repeat procedure to keep your board and other utensils from drying. There are no synthetic additives or hydrocarbons that can cause harmful effects when exposed to sunlight. It is food-safe, all-fragrant, and it soaks well into the wood. This oil is perfect for wood crafting businesses and for anyone who wants a natural oil that can soak well into the wood. It provides protection for about three months before you will have to re-apply, which can help you save time and money. This type of oil does not go rancid, and it can keep your wooden and bamboo cutting boards in great shape! Since it is a blend of food grade mineral oil and natural waxes, it has a great penetrating quality that can moisturize your wooden products and prevent them from cracking. Use it for your wooden bowls and utensils as well as your butcher blocks and cutting boards. After application, there is a different level of protection because of the product’s natural waxes. See how an easily stained exterior can turn into a beautiful and stain-resistant surface! The natural waxes that this product contains helps buff out knife marks, giving your boards a renewed and attractive look. You can use this product once a month for your kitchenware to be enhanced and protected at the same time. 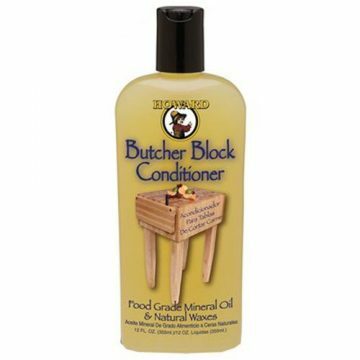 The conditioner in this product can make your wood look even better than it was when it was brand new! The organic natural lemon and orange oils mixture give out a wonderfully fresh smell. You can use it on your wooden and bamboo cutting boards, salad bowls, utensils, butcher blocks, and other items. It can keep them from splitting, cracking or drying and can give a quality and all-natural finish. It was made for basically any wooden product that can improve the condition of your board. When your wooden boards begin to look dull and start to wear out, you will need the perfect conditioning oil to treat them. This type of oil can set in deeply into the wood that creates a clean barrier to protect it. It contains wax and mineral oil that can revive wood surfaces and protect it with an improved coating. This product is also a great gift idea for your friends who are chefs, home cooks, and cooking and food enthusiasts! This highly refined coconut oil leaves no odor on your cutting board and keeps it clean with a natural smell. It has a thinner consistency and can penetrate deeper compared to other oils. It is not greasy, but thin and can soak well into your cutting board. If you like plant-based oils, this could be a good option for you. Ideal for all wooden and bamboo kitchenware, butcher blocks, etc. This product can help prevent absorption of unwanted or harmful liquids to your cutting board. It also contains essential oils that can remove unpleasant food odors. This oil is designed to prolong the lifespan of your boards, butcher blocks, and other bamboo products to help save time and money. With this product, you do not need to apply it often onto your kitchenware as it can hold a radiant look long enough. Experience a nice and fresh outcome after using this great citrusy oil! To use this oil, you can apply it using a soft cloth while following the direction of the grain. Allow it to set in for a few minutes and wipe after with a clean, soft fabric. This food-safe mineral oil can help enhance the quality of your kitchenware. It is suitable for your wooden cutting boards, countertops, butcher blocks, and teak wood furniture. Can help preserve and protect your wood products, servers, etc. This mineral-based oil can keep the natural beauty of your boards as well as your servers, salad bowls, and more. With only little effort, your board is protected from cracking or splitting. It is affordable, completely food-safe, and can give your board a smooth finish. This product has a very tender and watery texture that can also be great for skincare purposes! 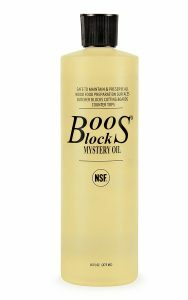 It is usually recommended to be applied after placing John Boos Mystery Oil (See #10). Simply squeeze cream directly across the board or butcher block. You can use your hands, a cloth or paper towel to do this and give it a few minutes for the cream to settle in. 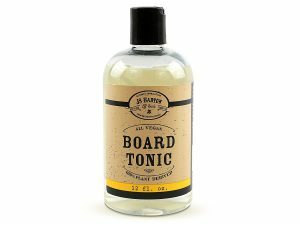 This will keep your board moisturized and protected from becoming dry from future washes. Repeat this process every now and then or as needed and see your board become beautiful again. Your board is nourished and preserved even before repeated washings. 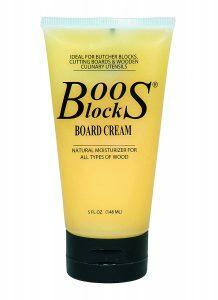 This cream gives a silky barrier to prevent your board from cracking, drying and bleaching. It works great for cutting boards, wood utensils, countertops, and butcher blocks. It is very easy to use which makes it effortless for you to maintain your board. This cream not only moisturizes and improves the appearance of your cutting board but also gives it an extended life. This type of food grade mineral oil is absorbed deeply into the wood to help prevent salad bowls and wooden utensils from damage. After constant use of this product, wood looks brand new again as it keeps them moisturized. The mixture of beeswax, mineral, and carnauba oil protects your board and revitalizes them at the same time. Your wooden boards and utensils are coated with a strong and glossy finish. It can efficiently absorb the mineral oil while leaving out water. It can be in direct contact with food and it also has natural antibacterial properties that give an additional level of food safety. Knife cuts and other scratches are removed to make your board look brand new again. Since this product meets all the requirements for food surfaces, you can use this for all kinds of food preparation services. It is colorless and odorless and it is easy to wash off from your hands. It keeps the surfaces smooth and takes away dirt effectively. 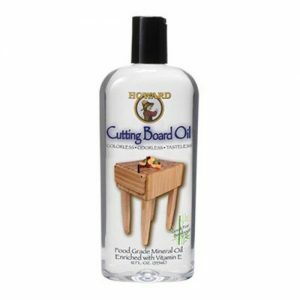 The oil is easily absorbed before it runs off onto your board with little to no residue. It gives your wooden pieces a soft glow that can make them look attractive. Because mineral oil does not tend to go rancid even after a period of time, your cutting boards do not acquire unpleasant odors. This type of oil is food-safe and can be applied on wooden cutting boards and butcher blocks to keep them in top condition. Squeeze oil onto the board and spread evenly on the surface using a cloth or paper towel. Let it rest for five minutes and wipe off excess oil. After application, you can see your cutting boards become moisturized and look as if they are brand new again. It is safe for food preparation materials and can prevent the wood from drying, cracking, and splitting. The linseed smell is very mild and your board is kept clean and protected. It can help in extending the life of your cutting boards and other wooden products. It is important for anyone to know what kind of oil is safe for wooden products and utensils since they come in direct contact with your food. It is a good thing there are a variety of great products that you can choose from that can fit your preferences. Whether you prefer mineral oil or a mix of natural oil and waxes, you can find plenty of options to select from in the market. Aside from treating your cutting boards with the best oils, your items would also need sanding or complete refinishing. It is also best that you take other necessary steps to keep your boards in good shape while treating them with the best oils.